PARIS, France, December 12, 2015 (ENS) – With the official UN climate negotiations still underway, thousands of people took to the streets of Paris this morning. Holding red flowers, umbrellas and banners, they created red lines along the boulevard Avenue de la Grande Armée and other streets to dramatize their opposition to climate-damaging fossil fuels. The Red Lines action was initiated by these groups: 350.org, Attac, Confédération Paysanne, Réseau Sortir du Nucléaire, Climate Games, Reclaim the Power, AITEC, Climate Justice Action and Global Justice Now. The Red Lines action was an official exception to a ban on public gatherings across France under a state of emergency after the terrorist attacks of November 13 in Paris that killed 130 people and injured hundreds of others. The demonstrators say their action was a peaceful way to honor the victims of climate change and a pledge to escalate action to protect the climate red lines, which the demonstrators say negotiations alone will fail to secure. “Without pressure from ordinary people, world leaders would have gladly ignored this problem entirely. It’s pressure from people that will close the gap between what was signed today and the action we need,” said May Boeve of 350.org after negotiators approved the world’s first universal climate agreement. 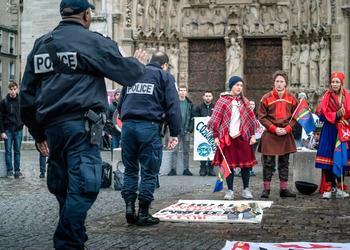 The demonstrations began at dawn as representatives from Indigenous nations from Circumpolar, Amazon, South Pacific and North American regions joined for an early morning sunrise ceremony prayer at the foot of the historic Notre Dame Cathedral, to close the climate negotiations. The ceremony was disrupted by Paris Police who came to the square and began to remove banners. The morning prayer circle was moved down the street to the Pont des Arts, where Indigenous peoples staged a direct action. “People discuss ‘red lines,’ we are the red line. We are the keepers of the land, protectors of animals, the seas, the air. We are the solution,” they declared. “The seas are rising, our communities have nowhere else to go,” said Maori activist Sina Brown-Davis. 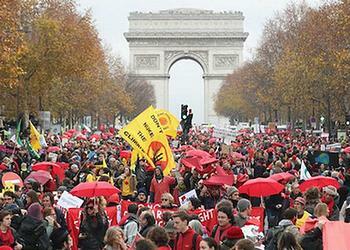 Starting at noon, Indigenous peoples joined in solidarity with the global red line action at Arc de Triomphe. 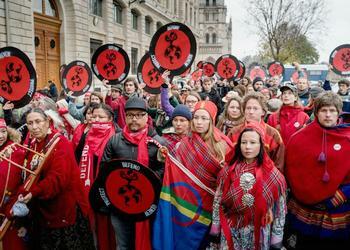 They condemned the “failed leadership of nation states for their exclusion of Indigenous rights and human rights” in the text of the Paris agreement. 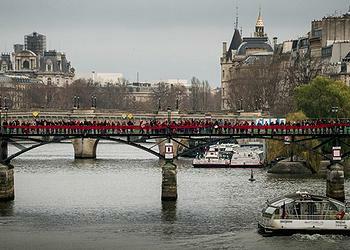 During the red line action demonstrators carried more than 5,000 red tulips, opened hundreds of red umbrellas and unfurled two giant red 100-meter long banners, turning the crowd into a huge red line for a just and livable planet that stretched one kilometer from Place de l’Étoile to Porte Maillot. A samba and brass band stopped playing when 30 foghorns marked the beginning of two minutes of silence for the victims of climate change, war and terror. Protestors raised thousands of red flowers in the air. “Our communities, our climate, our survival: those are our red lines, and we’re mobilizing to defend them. Paris has never been an end point for us, but a chance to get an agreement that will help us continue with our fight for climate justice,” said Parekh. The red line symbolically pointed from the victims to the perpetrators of the climate crisis – the fossil fuel industry. Organizers said the red line was designed to stretch from the site of the Arc de Triomphe, “a monument of militarism” that houses a memorial to the unidentified dead from both world wars, along the boulevard Avenue de la Grande Armée towards the business district La Défense, where the headquarters of several fossil fuel corporations such as Total and Engie and their financial backers are located. 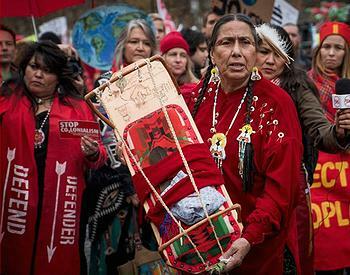 During the march, a traditional Ponca cradleboard was presented by the Indigenous people to the people of Paris. The cradleboard represents future generations and was carried by Casey Camp-Horinek (Ponca Nation, Oklahoma, USA) who spoke at the march. More than 50 Red Lines solidarity events were organized worldwide in North America, Europe, South Africa and Nepal.